A special Immigration and Customs Enforcement (ICE) program announced last August to reduce the massive backlog of pending matters by identifying those that could be dismissed or put on hold has resulted in the closure of 2,609 cases, according to government data covering the period up to the end of March. The backlog reduction is less than one percent of the 298,173 cases pending before the Immigration Courts as of the end of last September. The stated goal of the ICE program was to better prioritize and reduce the backup of pending matters that had led to lengthy delays in the proceedings of noncitizens it wanted to deport. So far, however, the pace of these closures has not been sufficient to stop the growth in the court's backlog. In fact, as of the end of March 2012, the Immigration Court backlog had risen to 305,556 matters. These and other results — by court and hearing location — are based upon analyses of very recent case-by-case records obtained from the Executive Office for Immigration Review (EOIR) under the Freedom of Information Act (FOIA) by the Transactional Records Access Clearinghouse (TRAC) at Syracuse University. EOIR, a part of the Department of Justice, administers the nation's special administrative court system charged with deciding whether noncitizens can be deported or are legally entitled to remain in this country. Figure 1. Sample from TRAC's Immigration Court Closures Tool (click to use the tool). This exact count by TRAC of cases closed through ICE's prosecutorial discretion initiative was determined by using special codes in the court data that TRAC received which tagged those closures made under the new program as of March 28. The codes also have made it possible to distinguish the type of closures made under this initiative. One out of four (25 percent) — some 650 cases — had been terminated by the Immigration Judge. This meant ICE "agreed" — albeit via an exercise of prosecutorial discretion — that the government did not have valid grounds to deport the individual from this country. The remaining three-quarters, or 1,959 cases, had been administratively closed by the judge. Administrative closures effectively placed the cases on hold without final resolution, but did allow the individuals to at least temporarily remain in the country. See TRAC's interactive tool. The formal process for ICE's review of pending cases initially focused on a special six-week pilot carried out in the Baltimore and Denver Courts between December 4, 2011 and January 13, 2012. ICE stated that it would review the results from this pilot on an expedited basis to determine the best methods to implement these processes on an ongoing basis nationwide. The Court data thus allowed TRAC to examine all recorded closures that had taken place in these two initial cities after an elapsed period of nearly eleven weeks since their pilots ended. ICE for its part has been surprisingly closed-mouthed, and despite the promised expedited review has not released its conclusions from the pilot. As discussed below, the agency also declined to provide TRAC with any further information for this report. As of the end of March — eleven weeks since this pilot ended — these court data are quite instructive on what is actually happening on the ground under this program. It is, of course, likely that closures will continue to rise given there appear to be cases still awaiting clearance steps by the government and agreement by the affected individuals. However, it should be kept in mind that many individuals in cases that ICE may be willing to place on hold also could have strong legal claims for remaining in this country. Such individuals may ultimately turn down a discretionary closure offer, preferring to have their legal status resolved by the Court right away. The most striking finding from these new data was that, despite the large-scale effort devoted to this pilot test, the hope it would materially reduce court backlogs in these test cities seems to be flagging. Only a small proportion of pending caseloads in either court has been closed as a result of this initiative thus far. In the Baltimore Immigration Court, a total 230 cases were closed. Compared to the 5,256 cases pending in that court at the end of last September, these 230 closures only represented 4.4 percent of the court's backlog. At the same time, in order to carry out the test, hearings on many non-detained cases were postponed. The average time pending cases have been waiting actually edged up from 513 at the end of last September to 523 days in March. There have been even fewer closures in the Denver Immigration Court, where only 186 cases were closed through this initiative as of the end of March, even though the backlog of cases there was larger than in Baltimore. A total of 7,579 cases (excluding detained individuals) had been pending in the Denver court at the end of last September. Thus, the 186 closures represented only 2.5 percent of that court's backlog. And the average time pending cases have been waiting increased from 542 days in September to 599 days at the end of March. A second surprising finding was that in Baltimore the majority of closures (57.4 percent) were terminations — 132 out of 230. Quite the reverse was true in Denver, where almost every closure — 184 out of 186 — was administrative. The explanation for the differences in the form that the closures took in the two pilot courts remains an open question. But the finding does indicate the importance of monitoring how ICE attorneys and other officials in various parts of the country are applying prosecutorial discretion standards. There were other intriguing findings. Judged by the proportion of their backlog closed under this initiative, the two pilot courts did not turn out to be the most active courts in the country. Among courts with a significant backlog, the Detroit Immigration Court led the nation with 5.7 percent of its backlog of 2,815 cases closed under ICE's prosecutorial discretion initiative. This was followed by the Portland, Oregon Immigration Court with 4.9 percent of its backlog of 2,151 cases closed as of the end of March. The Baltimore Immigration Court did have the highest number of closures (230) in the nation. 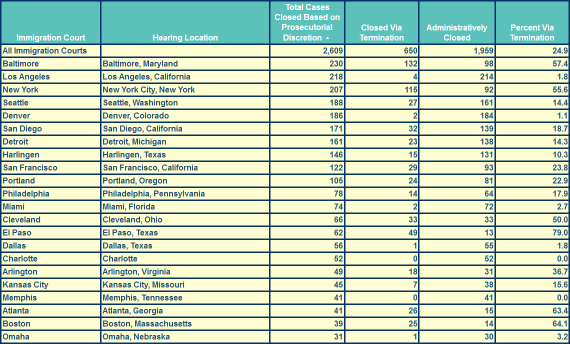 The Los Angeles Immigration Court with 218 prosecutorial discretion closures had the second highest number of closures as of the end of March. The New York City Immigration Court was third with 207 such closures, followed by the Seattle Immigration Court in fourth place with 188. Denver came in only fifth place with 186. The New York court was also notable because, like Baltimore, a majority of its closures — 115 out of 207 — were dismissed ("terminated") rather than administratively closed. A total of 59 hearing locations have had at least one closure under this program at the end of March; see TRAC's interactive tool for a complete list of the immigration courts by hearing location. The tool provides prosecutorial discretion closures by type, as well as compared with each court's pending caseload. TRAC's analysis was based upon the official records of the Immigration Courts. TRAC also contacted ICE's Public Affairs office on April 16 and asked the agency for any figures regarding the number of cases reviewed or closed through the exercise of prosecutorial discretion. TRAC received a curt response on April 18 declining to respond. In addition, on April 12, TRAC received a letter from the ICE's FOIA Officer, Catrina M. Pavlik-Keenan. In that letter, the agency's top FOIA Officer stated that the agency "cannot reliably identify" cases it has filed or has pending before the Immigration Courts, and thus had decided to withhold all data on its Immigration Court caseload. If truthful, the statement that ICE is unable to keep track of what cases it has filed in the Immigration Courts is an astounding admission, and one suggesting serious managerial problems within the agency. The Administration first announced a review of all cases pending before and incoming to the Immigration Courts on August 18, 2011, using the factors set out in a June 17, 2011 agency directive on prosecutorial discretion. This initiative encountered political criticism from some quarters as a backdoor amnesty program. Resistance to implementing the program was also reported within the ranks of the agency. Congressman Robert Aderholt, Chairman of the House Appropriations Subcommittee on Homeland Security, in his opening statement at hearings March 8, 2012 on ICE's FY 2013 budget request, criticized ICE initiatives "expanding the use of prosecutorial discretion." Following testimony of ICE Director John Morton at these hearings, ICE Congressional Relations office sent an email on March 9 with a "CORRECTION" subject line. That email stated that as of March 5, 2012 1,583 cases had been administratively closed or dismissed as a result of its case-by-case review of 165,471 pending court cases. The "correction" explained the relatively small number of closures by noting that there were a larger number of cases provisionally identified waiting "background checks" and that "many individuals decline an offer of discretion in order to pursue their cases in immigration court." No exact figures were provided on the number of these turn-downs. The correction email also did not specify how long these "background checks" should take, or what office was responsible for carrying them out. Despite the failure to release its evaluation of the results of its pilots, the agency on March 30, 2012 announced the next phase of its case-by-case review to determine in which ones it will exercise prosecutorial discretion. Supporting this effort EOIR "has agreed to temporarily and partially suspend non-detained dockets in seven additional immigration courts in the upcoming weeks." Impacted are the courts in: "Detroit, New Orleans, Orlando, and Seattle from April 23 until May 4; New York from May 7 until May 18; San Francisco from June 4 until June 15; and Los Angeles from July 9 until July 20." EOIR canceled the hearings for the already scheduled cases on those dates and rescheduled them for later. Because of its backlog, this reportedly resulted in postponing many hearings until 2014. Data from the two pilot courts showed that the pace of discretionary closures was steadily declining. As of the end of March, Baltimore closures had declined to between an average of 1 or 2 per workday and were falling. Denver closures, with their larger backlog of cases, averaged 2 per workday and were also falling. The email's reported closures differ from official court records by almost 20 percent, suggesting there may be deficiencies in ICE's own monitoring efforts. Court records showed that as of March 5, a total of 1,878 discretionary closures (not 1,583) had occurred.